Have you ever wondered about the menu on a new restaurant and wanted to ask your friends on Facebook? What about that new music album or places to visit in a new city? While experts or Google can help you answer that question, your friends probably know your taste a lot better. Look no more. Facebook has released a new feature called Facebook Questions. Facebook Questions made it very easy to answer questions. You can either agree with an existing answer with a single click, or you can add your own choice to the options. You can also choose the options such that if your friends answer one of your questions, their friends can answer it too. Facebook Questions is being rolled out to everyone but you can try it now by clicking here and enable Facebook Questions to your Facebook Account. 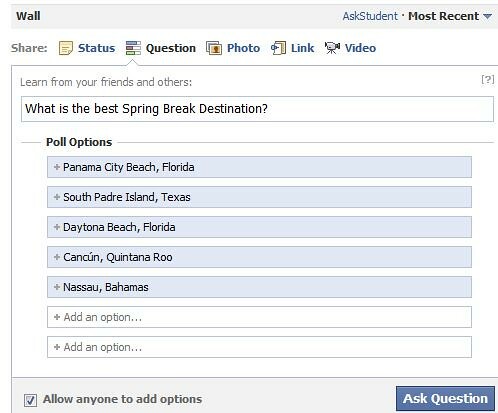 You can test it out by becoming a Fan of AskStudent on Facebook and answering the question below around Spring Break Destinations. Posted in How to and tagged facebook, how to, Polls, Questions. Bookmark the permalink.